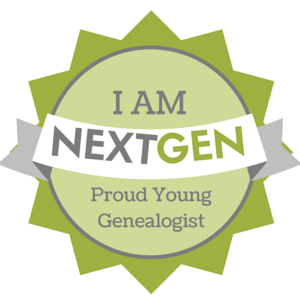 When I first started blogging about my research last spring (after years of meaning-to-but-not-doing-it), I casually made a couple of #52Ancestors posts, but something about not having started the challenge the first week made it harder for me to commit. And then I went to Missouri & Illinois on a long-ish vacation. And after we came home, I got a phone interview for a job. And then a video interview. And then a job offer. Which I took. And then I spent the summer getting ready to move to Salt Lake City (on top of starting ProGen Study Group and taking a DNA course through the University of Strathclyde). And then I moved, and spent the fall settling into a new job in a new city in a new state while living in temporary housing. And then I spent December settling into our new permanent apartment and heading back to California for the holidays. Let’s just say it’s been A Year. At any rate, blogging was a plate I had to put down to keep the others spinning in the air. But now: I’m (mostly) done moving. I’m getting into a good groove at my new job, although it still doesn’t feel real that I nabbed the job I pipe-dreamed about for nearly twenty years. The apartment is almost put together. We have internet. And a new couch! I’ve managed to carve out space for a cute little home office (obviously I’ll need to make a “look at my home office!” post at some point, but my files still need a permanent home…). Finding the time to blog when life comes at you as fast as it came at me in 2018 can be pretty difficult, but getting back into it takes just one post. So, this is the first post of the year. See y’all next week. When Mary (Nagle) Campbell died from childbirth complications on 31 March 1888,1 her widower James Campbell was left to raise their five children alone. Within a year, the three elder boys (especially George) were on the radar of the local authorities. In May of 1889, both the Plain Dealer and the Leader reported on George Campbell’s miscreant behavior. Although both articles and the teacher who exposed young George’s lies got some details about the family incorrect—namely that George’s parents were alive when in fact only one of them was living—there’s enough accurate information about the Campbells of No. 7 McCurdy Street to infer that James’s third eldest son, George (born in 1879), was the titular “bad boy” and “accomplished young liar.” George ran away again the very same night he was marched home by Agent Poole and remained missing for at least a week. Twelve-year-old Joseph was apparently in trouble as well, and the authorities wanted to send both boys to the House of Refuge. Whether they were actually incarcerated or not is not yet known, but what is known is that a year later, in April of 1890, George ran away again. Between the two younger children, Martha Jane (Jennie) and William (who turned seven and four respectively in 1890), and the apparently out-of-control older boys (especially George), James clearly couldn’t do it all alone. Help arrived on 14 June 1890, when James married his second wife, Fannie “N. Dean.” (Fannie didn’t have a middle name, and “Dean” was not her surname–but that’s all coming up in part five). The loss of the 1890 United States Census is especially acute when it comes to the Campbell family, as it’s the one enumeration year in which all of the Campbell children should have appeared with their father in one household–although it may or may not have included Fannie since she and James were married twelve days after that year’s official census date, 2 June 1890.8 Luckily, the census isn’t the be-all end-all of genealogical records, especially in a city like Cleveland. By 1891, Charles Campbell appears to have settled into work as a printer. He’s listed as such in the 1891/1892 Cleveland City Directory, residing at 7 McCurdy av. James Campbell, carpenter, is listed on the very next page, although his entry has him residing at 17 McCurdy instead of 7 McCurdy. On 27 August 1896, Charles Henry Campbell married Inga Theresa Simmons.14 A year later, on 3 September 1897, he applied to the probate court for guardianship of the estate of his younger siblings, George W., Martha Jane, and William E. Campbell, who were still minors. James and Joseph J. Campbell served as sureties on the guardian bond. Wait. What estate? Let’s back up. In 1883, James and his first wife, Mary, bought property on McCurdy Ave.16 When Mary died intestate (without a will) on 31 March 1888, both her widower James and her children inherited portions of her share of ownership. The minor children couldn’t legally make decisions about their share of the property, but a guardian appointed on their behalf could. So why would the elder brother, Charles, become guardian of his siblings’ estate as opposed to their father, James? Well, according to the 1897 probate code of Ohio, James was ineligible. On 28 August 1900, James Campbell applied for letters of administration on Mary Campbell’s estate, thus rendering him ineligible to be guardian of the minor Campells’ interest in the same estate. According to the 1900 Census, the residence on McCurdy was owned, not rented, but it was mortgaged rather than owned free.19 In the 1900 probate case file approving the sale of the property, a petition asserts that the entire family–James, Fannie, Joseph J., Charles, and the younger Campbell children via Charles’s guardianship–was beholden to an $800 mortgage held by one Benjamin Atkinson.20 I don’t know for sure yet (I need to find the Campbell-Atkinson mortgage deed, presuming one exists) but I’m guessing the mortgage with Benjamin Atkinson was executed in about 1897, and was the reason Charles became guardian of his minor siblings’ estate that year. As for why the actions on Mary’s estate didn’t begin until nine years after her death: so long as the family was living on the property and not attempting to refinance or sell it, then there was no reason to get the courts involved. In September 1900, the Campbells sold the McCurdy Avenue property to Mary Hawkins, apparently to wriggle free from the Atkinson mortgage. The sale of the lot and house that was the Campbell family home for seventeen years generated a deed which is a treasure trove of genealogical data, linking the entire family together–including Charles’s wife Inga and the tragically deceased Mary Christina (Nagle) Campbell. Well, almost the entire family. But I’ll get to that in Part Five. Although James immediately turned around and purchased a lot on Elroy Street from Mary Hawkins23 after the sale of the McCurdy Avenue property, he doesn’t appear to have ever lived on Elroy Street. By the time James filed the paperwork to become administrator of Mary’s estate in late August 1900, he was living at 2017 Nelson Street (see his application, above). Charles and Inga lived at 2017 Nelson Street when they were enumerated for the 1900 U.S. census earlier that year,24 so it seems James, Fannie, Martha Jane, and William moved in with Charles and Inga sometime in mid-1900. As I mentioned in Part Three, Mark McElroy was Martha Jane/Jennie’s husband, and they were married on 7 December 1903. Note Martha Jane’s residence, 2017 Nelson St.
Later that month, George W. Campbell married Mahala J. Wilson on 31 December 1903.27 Joseph James Campbell married Ellen Viola Mattern in Butler, Pennsylvania earlier that year, on 10 June 1903.28 By the time 1904 rolled around, only youngest son William Ernest remained unmarried and living at home. In 1904, home for William was 1723 Woodland Hills Avenue, which is the address James Campbell’s 1910 death certificate noted as his last home address before he was hospitalized long-term due to Parkinson’s disease.29 It’s also the address William provided as contact information in his Plain Dealer amateur baseball notices. In September 1904, Charles and Inga Campbell lost a nine-week-old baby girl to entero colitis32–just two years after they lost a nine-month-old son to cholera in August 1902.33 Both little ones were buried in section 76, lot 51 of Woodland Cemetery–the same cemetery where Mary Nagle Campbell was buried in 1888,34 but not the same plot. In the midst of all that, Charles seems to have had difficulty finding a steady occupation. He’s a “wiredr” (sic?) in the 1902/03 directory,36 and a finisher in 1903/04.37 The 1904/0538 and 1905/0639 Cleveland City Directories list him as a millworker. He’s a wireworker in 1906/07,40 then an ironworker in 1907/0841 and 1908/09.42 By 1909/10, Charles (H) Campbell of Nelson Street/Avenue disappears from the Cleveland Directory,43 then reappears on the 1910 U.S. Census living in…Los Angeles. Working as a street car conductor.44 Sound familiar? Oh yeah. James Campbell married Fannie N. Dean. And her obituary claimed her maiden name was McEchren. So was she Fannie N. Dean, Fannie Gill, or Fannie McEchren? Was “N. Dean” supposed to be Endean? Was “McEchren” an alternate spelling of McEachern? And what’s with William’s ex-wife’s parents’ surnames showing up in records about his stepmother? You’re probably starting to get why I call this Cleveland cluster a Gordian knot. Was William Campbell’s mother from England? Or was she from New York, or Pennsylvania? William Campbell’s mother, Mary C. Christina Nagle, was born in New York. Was Fannie Campbell actually William’s biological mother? No, she was not. She was his stepmother. Did Fannie Campbell die before 1920, or did she just move out? Fannie Campbell died on 5 January 1914. What were James and Fannie Campbell each up to before they got married in their thirties? James and Fannie were not married in 1881 as the 1900 census suggests. Before James married Fannie, he had a family with Mary C. Christina Nagle for fifteen years, until her death. What was William E. Campbell’s connection to Los Angeles, California? William’s brother Charles moved to Los Angeles and became a street car conductor in about 1909. It appears William accompanied his brother to California, then returned to Cleveland. If Fannie Campbell and Mary Naegel/Nagle are not the same person, what happened to Mary prior to 1900? Fannie and Mary were not the same person, and Mary died after complications from childbirth in 1888. When did James Campbell marry his second wife, Fannie? James Campbell married Fannie “N. Dean” on 14 June 1890. What was Fannie up to in the years after her immigration and prior to her marriage to James Campbell? What happened to the McCurdy Street property James purchased with Mary in 1883 and still owned in 1900? The family sold the property to Mary Hawkins in September 1900, after the census was taken. Were any of the Campbell boys ever actually sent to the House of Refuge? Okay, seriously though, what was Fannie’s maiden name? Was Fannie somehow related to Evelyn McEachern? Who were Mr. and Mrs. John Calan? See you in part five, when we finally find out about Fannie’s life before James, including the grisly suicide that made her a widow. By 15 April 1910 (the official census date that year1), Fannie Campbell was a widow–of one day. In fact, the William Campbell family was enumerated on a supplemental sheet in 1910,2 which means they either weren’t home or weren’t in a position to be interviewed the first time the census taker came by.3 Understandably so, because James Campbell died at the Cleveland City Hospital at 5:30 in the morning on 14 April 1910 after a long battle with paralysis agitans, better known as Parkinson’s disease. An obituary in the Plain Dealer reported that James died at home, which is probably the result of a mistake or miscommunication, considering the doctor signing off on the details, a Dr. O.B. Norman, would’ve known very well where his patient died after treating him for several years beginning 6 September 1906, as noted on James’s death certificate, which also states that James had been institutionalized at his place of death (the City Hospital) for 1288 days, or just over three and a half years. The Plain Dealer obituary mentioned the widow, Fannie, a son, William, and another son, George. George was not enumerated with the James Campbell family in the 1900 Census,7 nor was he mentioned in William’s 1962 obituary,8 or any other record we’ve examined so far. Snippet of Mark McElroy’s application for letters of administration on the James Campbell estate. There’s Fannie, the widow, along with William, and George. William Campbell is listed last, likely because he was James’s youngest son. Second to last is Martha J. McElroy, a.k.a. Martha Jane Campbell, who married Mark McElroy on 7 December 1903. Her parents were listed as James Campbell and Mary C. Hagel (sic) on the marriage license application, and her address at the time was 2017 Nelson St.11 Jennie is a diminutive form of “Jane,”12 so Martha Jane (Campbell) McElroy is almost certainly the same person as sixteen year-old Jennie Campbell from the 1900 Census. This James Campbell is thirty-three years old, which is a tidy twenty years younger than the James Campbell living at 56 McCurdy Street on the 1900 Census, who was born in July 1846, (although this consistent age between the 1880 and 1900 censuses is six years off from the 1840 date provided by William at James’s death). Both were born in England, although the 1880 Census lists James’s father’s birthplace as Scotland rather than England. James Campbell living on Sterling Avenue in 1880 was a carpenter, just like Fannie Campbell’s husband on McCurdy Street in 1900. However, there’s no Fannie from England (with parents from England) to be found in this 1880 household. Instead, James’s wife is Mary, born in New York to parents from Germany and New York, age twenty-seven–making her about five years younger than Fannie, aged fifty-one in 1900. Charles, the eldest son of James and Mary Campbell, was reported to be seven years old in 1880. The middle son, James, was four. George, the youngest, was one year old. All of them were born in Ohio–and would’ve been twenty-plus years old by the 1900 Census, which could explain why none of them were enumerated with James Campbell on McCurdy St that year. James Campbell’s Declaration of Intention. If James filed his Declaration as soon as he was eligible to do so, then he would have been in the United States by 1871 at the latest,23 which is only slightly off from the 1869 immigration date noted for him in 1900, and he might well have filed his first papers a while after he became eligible. Perhaps there were extenuating circumstances which inspired James to begin the citizenship process; Mary would’ve a been few months pregnant with Charles Campbell in July 1873 although she and James were not yet married. Sometime between July 1873 and November 1873, James (possibly with a pregnant Mary by his side) relocated from Rochester, New York to Cleveland, Ohio. But the boy in March of 1888 was stillborn,29 and Mary did not survive giving birth to him. The baby was buried in Woodland Cemetery on 29 March 1888, in the Southeast Avenue section, tier 1, grave 138;30 the same grave as elder brother Joseph James’s lost twin. Mary died from hemorrhaging two days later, at one in the afternoon on 31 March 1888, and her death record notes her birthplace: New York.31 The Plain Dealer reported that she died in childbirth,32 the Leader said it was fever.33 When Mary’s funeral notice was printed, the Leader added a note for the papers in Rochester and Le Roy, New York to “please copy,”34 most likely so any family she still had in New York would know of her passing. Mary C. (Nagle) Campbell, the beloved wife of James Campbell, was buried in Woodland Cemetery on 2 April 1888, in section 65, tier 1, grave 16,35 where her husband would join her in thirty-two years and two weeks—to the day. Was William Campbell’s mother from England? Or was she from New York, or Pennsylvania? William Campbell’s mother, Mary C. Nagle, was born in New York. What were James and Fannie Campbell each up to before they got married in their thirties? James and Fannie were not married in 1881 as the 1900 census suggests. Before James married Fannie, he had a family with Mary C. Nagle for fifteen years, until her death. When did James Campbell marry his second wife, Fannie? What was Fannie Campbell’s maiden name? What happened to the McCurdy Street property James purchased with Mary in 1883 and still owned in 1900? Next up, Part Four: James and Fannie, in which George Campbell nearly gets himself sent to the House of Refuge, William Campbell plays baseball, and Charles Campbell gets attacked in the middle of the night. I call this branch of my relatives a “Gordian Knot” because their story (and the records telling that story) are so complex and confusing as to seem impossible to solve. But with well-honed genealogical methodology and analysis skills, you can make like Alexander the Great and cut right through the snarl. For the sake of spinning a good yarn (pun oh-so-very intended), we’ll begin in the middle. This is the 1900 U.S. Census enumeration of the James Campbell family at 56 McCurdy Street in Cleveland, Ohio. It seems like a fairly straightforward record with internally consistent information: James (age fifty-three) and Fannie (age fifty-seven) Campbell, who immigrated from England in 1869 and 1871 respectively, were married in about 1881 when they were in their early thirties. They had two children, both born in Ohio: sixteen year-old Jennie in December 1883 and 15[?] year-old William in January 188[?]. Fannie had given birth to ten children, two of whom were living. James worked as a carpenter, Jennie as a shoe saleslady, and William as a messenger boy. James was a naturalized citizen (in 1900 his citizenship would have extended to Fannie through marriage2), and he owned their mortgaged home. If the only record you had of this family was this one census sheet, you would have no compelling reason to believe the Campbell family was anything other than exactly what it appears to be: a pair of English immigrant parents with their two American-born children. You’d be wrong, even though the decade or so long gap between Fannie’s and James’s immigration(s) and their marriage is the only thing even close to a red flag here. The gap doesn’t inherently conflict with any of the information about the James Campbell family in the 1900 Census, but it is curious. Both Fannie’s and James’s twenties are largely unaccounted for in the information we can glean from this record. Moving on to the 1910 Census, we find William Campbell (age thirty-four), a street railway conductor, living with his wife, Eveleyin (age eighteen), and his widowed mother, Fannie (age sixty-one). William has magically aged about nine years between 1900 and 1910, but such things are not uncommon with census records, which is why they should always be cross-referenced with other records–especially in this case, as we’ll soon see. Fannie’s immigration year (1872) is only one year off from the 1871 date on the census ten years prior, but instead of having given birth to ten children (two living), this census says she’d given birth to six children, all living. That’s a pretty major conflict–a big enough one that you might be inclined to start believing that perhaps this Fannie and William Campbell, living in a rented home at 10004 Cumberland Avenue in Cleveland, aren’t the same ones who lived at 56 McCurdy St in 1900. But they are. I promise. Although the 1910 Census explicitly states that Fannie Campbell is William Campbell’s mother, and although this information is consistent between the two censuses we’ve observed so far in almost every way, there’s just this one seemingly tiny thing. If Fannie Campbell, who according to both the 1900 and 1910 Censuses was born in England and immigrated to the U.S. in 1871/2, was William Campbell’s mother, why does the 1910 Census say William Campbell’s mother was born in New York? If you look closely, it appears that the enumerator began to write “England,” but then crossed it out in favor of New York, as if he’d been corrected as he was writing. For now, let’s skip ahead to 1920. In 1920, William E. Campbell, a railway conductor, was renting his house at 9601 Lamontier Ave in Cleveland, Ohio. He lived with his wife, Mary, his three year-old daughter Mary Jane, and a boarder named John Callan (a widow from West Virginia who worked as an engineer in a stationary shop). William’s reported age is once again inconsistent with the previous census, although it’s within reasonable striking distance of his age in the 1900 Census. But Eveleyin and Fannie from 1910 are gone, and this time William’s mother’s birthplace has been given as Pennsylvania. Fannie would’ve been seventy-one years old in 1920, so it’s possible she’d died by then, or perhaps she was simply living somewhere else. As for Eveleyin, this Mary is twenty-eight where Eveliyn was eighteen in the 1910 Census. It’s possible that Mary is a middle name and that the two women were the same person, but if so, her birthplace shifted from Ohio to Pennsylvania, and her parents swapped birthplaces. The William E. Campbell family lived at 360 Columbus Street in Bedford, Ohio (a suburb of Cleveland) in 1930. No longer a renter, William owned their house and he still worked as a street [railway] car conductor. His age, forty-four, is (at last) consistent with the previous census, as well as the 1900 Census. His mother’s birthplace, Pennsylvania, is consistent with the previous census as well. William’s wife, Mary’s data is also consistent, with the addition of the middle initial H on this census. Information about their daughter, Mary J[ane], is also consistent between 1920 and 1930. William and Mary’s ages at marriage were given as twenty-seven and twenty-one, respectively. Based on their ages in this census, their marriage date was about 1913, three years after William was living with his wife Eveleyin in 1910, thus lending more credence to the theory that Mary and Eveleyin are in fact not the same person. In 1940, the Campbell family was still living at 360 Columbus Street in Bedford, Ohio, and William E. Campbell was still a conductor for a street railway. His age, fifty-two is once again inconsistent from the previous census, but not by very much. Data about his wife, Mary H, is totally consistent with the 1930 census, as is the data about Mary Jane, who by now was twenty-three years old and working as a bookkeeper for a wholesale paint factory. Unlike previous censuses, in which there is (usually) no way to know who told the census taker what about who, the 1940 census enumerators indicated their informants by marking them with a circled “x.”7 In the Campbell family’s case, the informant was the wife, Mary H Campbell, which is going to be important later. Are Eveleyin and Mary Campbell the same person? As you’ll quickly see with the Campbells and their extended relations in Part Two: The William E. Campbell Vital Records, the more questions you answer, the more questions you have. If ever there was a case of genealogical research question whack-a-mole, it’s this family. Luckily, they lived in Cleveland, a city that is nothing short of a goldmine, records-wise, both in in terms of quantity of records kept as well as their availability. Stay tuned, because this plot twists like Chubby Checker. Part Two.